Specialist. Gimme a call gonna play the toboggan Wed. I have monday and tuesday off. lets shoot monday afternoon. you gonna post that 5? you have to putt exclusively with an arrow all season (6 months) and if you manage to do so you get your choice from my collection. AND you get to keep the arrow. I love it. so youre throwing the rwpro roc? We'll have to get a round in so you can post some scores. I'm back home. I went on a trip to find some answers and enlightenment. Those I found, but don't have any disc scores to post. Thanks to all those who helped. Any News ?! I'm officially starting to worry and be sad. He drives a bright red Nissan Cube. I've got your drone in my trunk from the 4 keg challenge, need to get it back to you. michael has not posted any pictures. nice to hear that roc in earning for you. 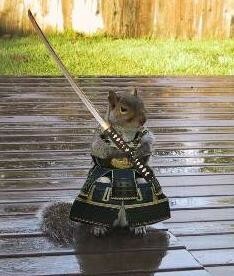 Beware the samurai squirrel! He is the one who steals your disc when you shank it into the woods. Friggin' hilarious, Mike. Cute and deadly at the same time. All shots within 30 ft.